Who is Major General Qasim Soleimani? Major General Qasem Soleimani ? ?, was born on 11 March 1957. He has been part of The Guardians of the Islamic Revolution, and a member of Pasdaran – Iranian Revolutionary Guard Corps (IRGC), since 1979. Veteran of the Iran–Iraq war. 1990s, IRGC commander in Kerman Province. He was stationed in northwestern Iran, and participated in the suppression of a Kurdish separatist uprising in West Azerbaijan Province. Commander of Iran Quds Force – provides military assistance to Hezbollah in Lebanon and Hamas PT. 1999, student revolt in Tehran- signed a letter to President Mohammad Khatami the letter stated that if Khatami did not crush the student rebellion the military would, and might also launch a coup against Khatami. March 2007, Soleimani was included on a list of Iranian individuals targeted with sanctions in United Nations Security Council Resolution 1747. 24 January 2011, Soleimani was promoted to Major General by Supreme Leader Ali Khamenei. In Iraq, he served as the commander of the Quds force, and is believed to have strongly influenced the organization of the Iraqi government, notably supporting the election of previous Iraqi Prime Minister Nuri Al-Maliki. Soleimani helped in formation of the National Defense Forces (NDF) in Syria. 18 May 2011, he was sanctioned again by the United States along with Syrian president Bashar Assad and other senior Syrian officials due to his alleged involvement in providing material support to the Syrian government. 24 June 2011, the Official Journal of the European Union (EU) said the three Iranian Revolutionary Guard members now subject to sanctions had been “providing equipment and support to help the Syrian government suppress protests in Syria”. The Iranians added to the EU sanctions list were two Revolutionary Guard commanders, Soleimani, Mohammad Ali Jafari, and the Guard’s deputy commander for intelligence, Hossein Taeb. September 2011, Soleimani was also sanctioned by the Swiss government in due to the same grounds cited by the EU. October 2015, it was reported that he had been instrumental in devising during his visit to Moscow in July 2015 the Russian-Iranian-Syrian offensive in October 2015. Soleimani is listed by the United States as a known terrorist, which forbids U.S. citizens from doing business with him. Military intervention through ideological proxies and hard-nosed strategic diplomacy. Irregular warfare missions inside Iraq by the Ramadan Headquarters. Soleimani established relations with Kurdish Iraqi leaders and the Shia Badr Organization. Major General Qasim Soleimani has been described as “the single most powerful operative in the Middle East today” and the principal military strategist and tactician in Iran’s effort to combat Western influence and promote the expansion of Shiite and Iranian influence throughout the Middle East. June 2016, Major General Soleimani is leading the fight to take Fallujah in Iraq. He is projected to secure Fallujah sooner than expected given U.S. Air Platform are now conducting pinpointed airstrikes against enemy targets which are being called in by the U.S. Special Operations Joint Terminal Attack Controllers (JTAC’s). 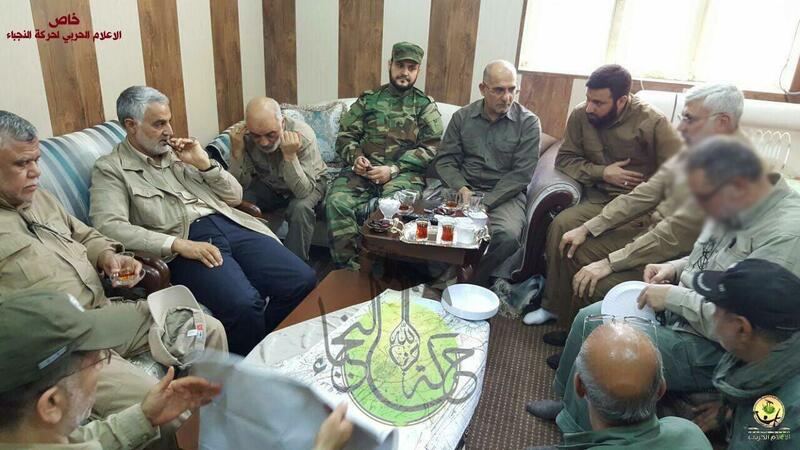 NEC-SE feature photo shows Major General Soleimani in his commanders planing meeting in his Fallujah Joint Operation Center (JOC), 25 MAY 16.